I was a post or two short this week, so much happened that it was a blur. Let’s catch up on Instagram. With our guest room remodel, we have been shifting furniture all over the second floor of the house. The ‘dog couch’ in the craft room, however, has remained in place. Much to Greta’s delight. I’m taking a lot of joy from all the trees and flowers that are now blooming. Buddy, though, is not so fond of the April showers that bring May flowers. Here he is glued to my side during one of a few thunderstorms that we experienced last week. Greta was just as close on my other side, making me a doggie sandwich. So when I wasn’t trapped on the couch between two dogs, I was cleaning out closets and drawers. How is it that a project in one room results in so many other projects? I know I’m not alone here. The good news is that more couch time meant more time for pinning. If we weren’t replacing the back stairs with a small powder room, I would definitely be using this idea of putting wallpaper samples on the stair risers. Yes, I am an adult. I am! That doesn’t stop me from wanting these Super Mario pillows and this superhero comic book pillow in my living room. Geek chic. I told Glamorous Mommy that I am totally stealing this chalkboard art idea, since I have these exact Target prints. I just finished my own cookbook bird house, but now I want another one, or three, like these road map bird houses. Some one serve me up one, or three, of these lemon vodka slushies. Yum! I think that I could eat this warm salad with all the Spring produce superstars weekly. I am so making a gluten-free version of this Ploughman sausage and cheese pie. Mother’s Day will be here in a flash. This handwritten recipe tea towel would make a lovely gift. Of course, flowers in this gold-dipped vase is a sure hit too. And if you aren’t feeling crafty, support other crafty artisans with a gift like this family tree pillow. Have a splendid weekend! I have thrift shopping and room remodeling on my agenda. This entry was posted in 365Project, Inspiration, SeeKarenLink and tagged #365project, #art, #cocktail, #craftproject, #gifts, #gluten-free, #instagram, #Mother'sDay, #recipe, #tutorial, #vodka on April 20, 2013 by annumography. If you ask my husband, he will tell you that his favorite holiday is St. Patrick’s Day. With the below-average temperatures that we have been experiencing lately, we will likely stay close to home this St. Patrick’s Day weekend. 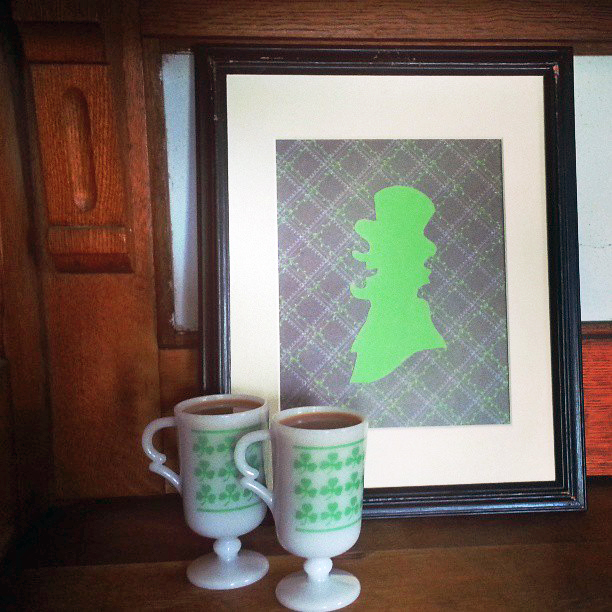 So I’m pulling together some Irish-inspired decor to make things a little more festive around here. I mean, you can’t just let a favorite holiday go by without decorations can you? 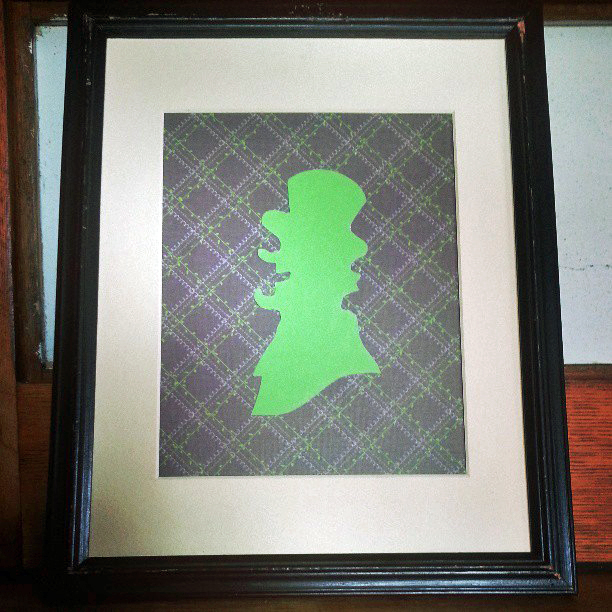 I adore Eclectically Vintage’s bunny silhouette, and it inspired me make my own St. Patrick’s Day artwork. To begin, I pulled out some frames that I bought at a yard sale a couple of summers ago for a quarter a piece. Isn’t it funny what you sometimes fine when you pull apart old ‘artwork’ from a thrift store or yard sale? These fruit prints were actually from a 1991 calendar. I know that I will probably never use them and should throw them away, but I will probably add them to my craft horde for future project opportunities. Just in case. To make the actual silhouette, I found a free image that I liked online. I played around with it a little in my Paint program to attach the head from the online image to some shoulders. I like shoulders. Then I printed the image on my home printer and cut it out to use as my template. This is the black-ish image above. I traced around the template onto some green card stock. Then I cut out the image with ordinary scissors. To cleanly cut out the silhouette, I made sure to keep the traced outline on the outside of my scissors. You can see some of the leftover outlines on the card stock above. After I finished cutting out the entire image, I cleaned up any rough edges with my scissors. See, no fancy machine needed. I used double-sided tape to attach a piece of scrapbook paper to the back of the mat in the yard sale frame. 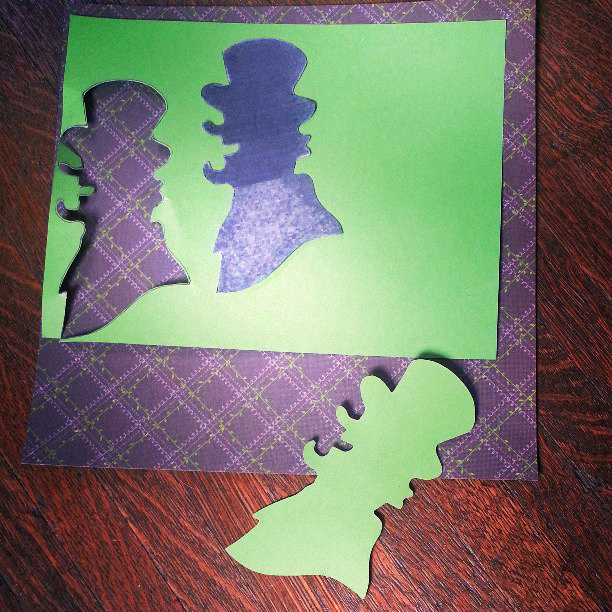 Then I flipped the matted paper face-side up and centered the silhouette image. Marking where the image would be placed, I removed the image and turned it over, so that I could put more double-sided tape on the back. My secret for getting the double-sided tape right to the edge, so that the silhouette lies completely flat? I put the tape on the image, so that it hangs over the edge of the silhouette. When the silhouette is well covered with the tape, I trim the excess tape from the it with my scissors. I taped the silhouette to the matted scrapbook paper, and placed the mat and backer into the frame. The frame is a little chippy around the edges, and I love it! To celebrate, I poured a couple of coffees. And maybe I did Irish it up a little with some whiskey. Who says you can’t start celebrating St. Patrick’s Day a little early? This entry was posted in Inspiration, SeeKarenCraft, SeeKarenThrift and tagged #art, #craftproject, #holiday, #rummagesale, #silhouette, #tutorial, diy on March 14, 2013 by annumography. Remember when I told the story of 1960’s Annette painting a pair of watercolors in her pretty pink bedroom? Well it turns out that Annette is actually Artis, and these watercolors were really painted in 1947. Doh! I’m sure that I read this handwritten inscription on the back of each painting when I first purchased the watercolors. They have been hanging in my foyer long enough, however, that this detail was conveniently forgotten when I wrote the first post with such romantic, creative license. That’s what I’m telling myself, anyway. Truth be told, I could have just as easily forgotten that detail in a week…or less. Ahem. So I mentioned in my previous post my plans to bling-up these blonde frames with a little gold-leaf action. I decided that this weekend was THE time to give these Asian beauties the glitzy love they deserved. Too impatient to go buy some gold-leaf, I decided to use some of the metallic gold paint that I had left over from this project. With painters tape in one hand (I didn’t want to disturb the original framing and Ms. Stover McKersie’s inscription) and a cheap sponge brush in the other, this project took less than 15 minutes to complete. The change is small, but I love how the gold frames look against the wallpaper. Now, as usually happens when I make one improvement, I noticed all the other little things I wanted to change. To pull more color from the paintings into other parts of the foyer, I moved the Crate and Barrel pillows from the living room swivel chairs to the built-in bench seat. I also bought a new shade at Garden Ridge for the credenza lamp (on the far-left). Hmm. 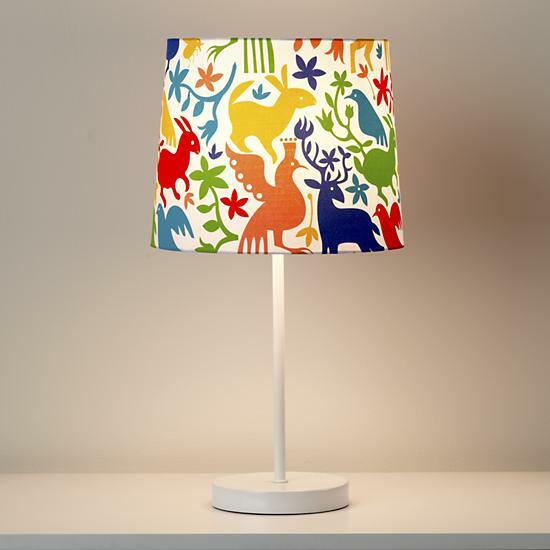 I love the shade with the vintage tangerine glass lamp, but the scale is a little off. It may not look like it in this photo, but trust me. Expect to see this duo move to another part of the house soon. I also finally got around to trimming the wallpaper around the stairway. It’s only been like this for about…oh…three years. Yup. I’ve never been a good finisher; ask my high school track coach. Speaking of little things, my sweet Buddy boy approves of the new changes in the foyer. What is he staring at so intensely, you ask? Oh nothing. He’s just concentrating on givng the camera his best profile. Divo! This entry was posted in 365Project, SeeKarenThrift and tagged #365project, #art, #CrateandBarrel, #GardenRidge, #instagram, #thriftstore, #vintage, #watercolor on March 11, 2013 by annumography. A couple years ago, I found this pair of watercolors on the online Goodwill auction. I think I won the auction for less than $5 for the pair. Since our foursquare-style house has some Craftsman architectural influence, I like to bring some Asian decor into our eclectic mix. Once the framed watercolors arrived, I noticed some small details that I couldn’t see in the online pictures. Each watercolor is signed A. McKersie, and it appears that the framing isn’t a professional job. The scalloped, faded pink mats look as if they are cut by hand from paper. These details make me love the watercolors even more. I like to imagine a young art student named Annette painted this geisha and her musician lover in a pretty pink bedroom in her parents’ suburban home. It’s 1964, and Annette is conflicted between her desire to marry her high school sweetheart, Tom, and her dreams to be an artist in the city. The empowered geisha symbolizes her desire to be more than a traditional wife and mother, yet the musician is representative of her own love for a man that won’t necessarily lead her to fame. 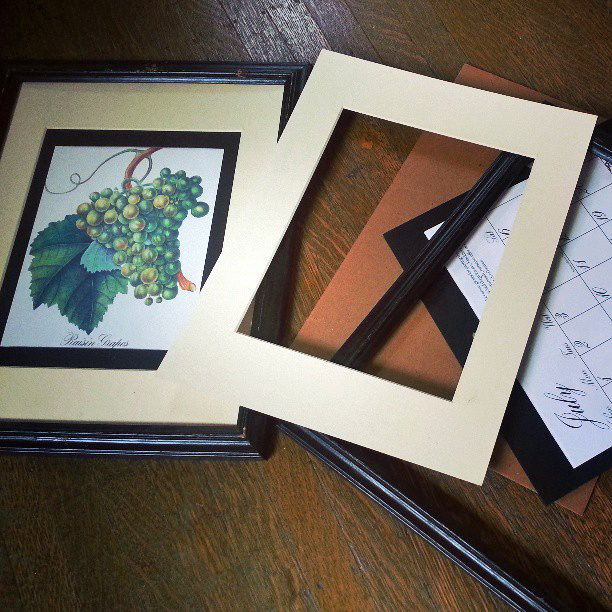 I have plans to gold-leaf these frames soon, but I wouldn’t change another thing about them. I feel like I have been given the honor of preserving Miss McKersie’s artistic expression. And telling her “story”. This entry was posted in 365Project, SeeKarenThrift and tagged #365project, #art, #instagram, #thriftstore, #vintage, #watercolor on February 6, 2013 by annumography.